Sniffing the wind, its tiny ears swivelling round to get more information, one of the Kruger National Park's rhinos is distinctly uneasy. The wind is against it, favouring the predator – or in this case, the horde of journalists and photographers snapping away and scribbling notes. And with awful eyesight it can do little more than face the apparent danger, intimidating with its horns. This is the problem of the rhino: the lumbering mass of muscle is hopeless when faced with a threat that is not standing right in front of it. In the wild its only aid is the oxpeckers that spend their time eating its lice and ticks. For a constant supply of food they will make a fuss by flapping about and squawking when their much better senses pick up an intruder. Often their warning is enough to send the rhino ambling to safety, but with skilled hunters after them it is up to the Kruger's authorities to protect them. And this low-level war is seemingly starting to swing in their favour. "Think 10 years from now, when we could have the only population of rhino left in the world – that's why we need to get on top of this fight now," said ranger Jannie Jurgens. As a walking-tour guide he gets tourists as close as he can to the pachyderms. When the poaching of rhino for their horns increased two years ago, anti-poaching measures were minimal. "We have come an amazing distance in so little time and this is a fight we are going to win," he said. The spike in poaching has been attributed to a belief in the East that rhino horn can cure cancer, but senior South African National Parks (SANParks) investigator Frik Rossouw said the horns have had special meaning in cultures for millennia. "The ancient Greeks believed that the horn could filter and purify water and the Persians thought it could negate poison in water, so this is not a new thing," he said. With world demand pushing prices as high as R65 000 a kilogram, compared with R8 000 in 2006, there are plenty of people willing to cross the park's 398km border with Mozambique to shoot rhino, he said. And with 500 rangers to cover 20 000km2, the poachers are able to strike all over the park, whenever they want. This is why 252 rhinos were killed in the park last year – a number that is set to be exceeded this year. Bruce Leslie, the head of the Kruger's anti-poaching special operations team, has a great deal of respect for his adversaries. "These poachers have grown up in this type of terrain and they have spent their lives hunting and trapping smaller animals for subsistence. So when their crops fail and a syndicate offers them money to shoot an animal, they are going to take that. This is about them looking after their families, so it's an economic issue," he said. One solution is to employ these skilled hunters as rangers and have them on his side. However, training and equipment are expensive and this is where the large private sector donations are coming in handy. A trauma kit costs R1 200 and the training to save someone who has just been shot is R900. The R1 and R4 rifles the rangers use start at R15000 each. A full kit and the training to survive in the wild and fight a low-intensity war can come in at R100 000 for each ranger. Their opponents have it much cheaper – a rusted AK-47 is rumoured to be as cheap as R3 000 and they are able to slip into the park and survive without the support and logistics the rangers need. In winter the poachers set up ambushes around water holes, knowing the rhino have little choice but to find the few that still have water. In summer the poachers are hard to spot in the lush vegetation as the park bursts into life. The rangers and the army have observation posts set up around the park. One of the men who sits in these, Phalaborwa ranger Rodney Landela, said the objective is to blend into the landscape and remain undetected for days. "You have to sit out there on full attention. You normally sleep for half an hour then swap with your partner, so there isn't even time to snore," he said while ­sitting around a crackling fire. To avoid detection they have to move to their camp on foot. Cooking is done in the middle of the day when the wind is least likely to blow their smell or the smoke around. Most of the time dry food is the order of the day. They camouflage their position and wait to see, hear or sniff out poachers. This all has come about through a steep learning curve. In the past, helicopters or cars might have supplied posts, alerting the poachers to the position, which they would bypass. The one major advantage for rangers is the disturbance humans make: branches are caught in clothes and whip about, twigs crack underfoot along with dead grass, and a trail of footprints shows the way for anyone following – especially when poachers are laden with heavy horns. Birds are also likely to fly away and advertise a disturbance. During full moon, when the poachers have enough light to hunt at night, Rossouw said the park has up to six helicopters on rotation. In ideal circumstances a tip-off will lead to poachers getting arrested on their way into the park, but all too often, he said, there is a scramble to respond to gunshots – whose sharp, staccato rattle travels for kilometres in the bush. Poachers' tracks are followed through the bush, at which point a helicopter is called in. Rossouw said the hope is that the poachers will hide and wait for the helicopter to leave for fuel, which gives the rangers the time to track them down. The park has drafted hardy dogs. They work with their handlers to follow the scent of poachers, making the chase easier and ensuring that one flank – whichever is downwind – is safe. Leslie, one of the brains behind the initiative, said this had made it safer to track poachers. Another pack of dogs is being trained to hunt the poachers. Bakkies or helicopters will drop them near an area and they will move with their handlers to tackle poachers and terrify them into not offering resistance. Both of these measures are already proving to be effective, he said. To secure convictions, SANParks is working with Dr Cindy Harper and the University of Pretoria's veterinary faculty. This partnership has led to a revolutionary DNA tracking system that can match the horn of a rhino to the carcass it came from. Securing convictions is notoriously difficult, but Harper said in its two years of operation the system has come very far. Knowing how good the DNA evidence is, lawyers advise their clients to plead guilty and get a lesser sentence rather than try to fight the charges, she said. Even a trace amount of rhino DNA on people's clothes or in their cars can be traced back to a poached rhino. Harper's plan is to enter every rhino in Africa in her database and she has already started branching out to Kenya. "This will allow us to trace the horn in consumer countries to a specific rhino, which will allow for the proper enforcement of Cites [the convention that oversees the trade in endangered species] and make it that much harder for people to trade horn illegally," she said. For poachers the contest may still be slightly in their favour, but all the people involved in stopping them are sure this is the high tide before they are pushed back. Already the legal system has changed: Rossouw said in the past judges would impose fines, which did little to deter poachers, but now courts only hand down jail sentences. The Kruger National Park's most recent big bust came after rangers ­followed the shaft from a crossbow that had been used to kill a rhino. The name of the shop where it had been bought was emblazoned on the side of the shaft, so SANParks investigators paid it a visit. The owner did not have details of the buyer, but when he returned for more shafts his details were recorded. He was shadowed and a large group was nabbed for poaching. The case is in court. In another bust a man camped in the park for six months, hunting animals to meet demand outside the park. Attempts to find him were unsuccessful until rangers dressed as poachers and found his camp. He started talking to them about his activities and they promptly arrested him. His six months in the bush turned to 17 years in a small jail cell. The park has also served as a transit route for car thieves. It was popular a few years ago until rangers started ambushing them. The main roads to Mozambique were spiked – with a sprinkling of chillies around each trap to keep animals away – and rangers and police would wait for them to drive over the spikes. This proved so effective that the thieves stopped using the Kruger as an escape route. There are five species of rhino left. The black and white rhino are located in Africa and the other species are Indian, Sumatran and Javan. There are some 5000 black rhino and 21000 white rhino left. Most of them are in South Africa. Black rhino are listed as critically endangered – up to 97% of the population has been wiped out in the past few decades. They tend to be easier to poach because they live on their own and are very curious. Their white cousin is bigger and tends to live in small family groups, grazing on grass. The date was 03.08, but that is probably the day that it is posted. BELA BELA - They’re big and slow, have bad eyesight and are colour blind. But the elephant’s superior sense of smell could potentially make it a useful ally in battling poaching. At least, that’s what researchers working at an elephant sanctuary in Limpopo are looking into. On this World Elephant Day, eNCA's Michael Appel met up with some of the experts. With excellent visibility from the cockpit, a fitted GPS, radio and transponder (with which it can be tracked from nearby airports), it is ideal for use in surveys of rare animals and of course counter-poaching action. LETABA – He has done it on foot, but now, with an aerial perspective, section ranger Andrew Desmet can serve his beloved Kruger National Park (KNP) even better. Desmet is one of three ranger pilots in the park with a newly upgraded Bat Hawk light sport aircraft, designed and built by Micro Aviation SA in Mbombela, at his disposal. This ranger of the Letaba section in the KNP is no stranger to the challenges of game ranging and anti-poaching operations. In 2013 he miraculously recovered after having been shot four times with a high-calibre assault rifle during such an operation. The Bat Hawk is sponsored by the Conservation Services National Project of the SANParks Honorary Rangers, which also recently paid for an engine upgrade at a cost of R175 000. This project is chaired by John Turner, and the craft is now fitted with an improved and more reliable Rotax engine. This engine is water-cooled and extremely suitable for circumstances in the KNP. During a demonstration of the aircraft in the Kruger, Desmet explained the benefits of having the services of such an ultralight craft. It is comparatively cheap to buy and maintain, but can still reach an airspeed of 75 knots (about 140 kilometres per hour). It is valuable as a surveillance tool for normal reconnaissance in his section, but with a range of four and a half hours he can also reach any point within the park with still some fuel left. The craft flies on standard fuel and consumes about 12 litres per hour. With excellent visibility from the cockpit, a fitted GPS, radio and transponder (with which it can be tracked from nearby airports), it is ideal for use in surveys of rare animals and of course counter-poaching action. It can fly at only 200 feet above the ground and at a speed as low as about 54 knots (100 kilometres per hour). Desmet explained that the craft is an indispensable complementary device to all other means of anti-poaching and the park would hopefully eventually have one per region. Apart from being able to quickly respond to tracking situations, it is very effective in suppression work to enable teams on foot to catch up with suspects. Desmet and the Bat Hawk have already been involved in a few success stories and he hopes to be of more service in future. “I love the park,” he said. “Flying the Bat Hawk gives me a unique and better perspective of my job. World-renowned adventurer, Sibusiso Vilane, has committed to continuing his fight for endangered species when he takes part in the 2018 edition of the Rhino Peak Challenge on 22 September – World Rhino Day. He will be representing the Endangered Wildlife Trust (EWT) while taking on this fantastic challenge. 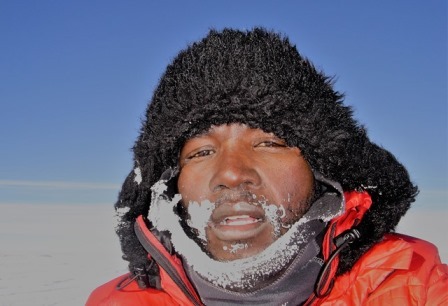 Sibusiso’s list of achievements includes summiting Mount Everest twice, summiting all seven of the world’s highest peaks and walking to the South Pole unassisted. The upcoming Rhino Peak Challenge will pale in significance to his previous feats; however, he understands the importance of an event like this. Organisers of the event have hoped that Sibusiso would take part in the past but due to his busy schedule, it hasn’t been possible. The intervention of EWT CEO, Yolan Friedmann, allowed Sibusiso to be confirmed for this year. He explains, “I was running my ninth Comrades Marathon this year when an old friend, Yolan, reminded me about the Rhino Peak Challenge and before I knew it she had recruited me as I said I had nothing planned for those dates!" As an ex-game ranger, Sibusiso has been at the forefront of conservation in South Africa and understands the importance of events and awareness drives like the Rhino Peak Challenge. He keeps conservation of all animals close to his heart. “Not just rhino conservation, but all wildlife matters to me and I believe that we have a responsibility to make sure that they are protected and conserved. I cannot stand and watch from the sideline while the rhino is being wiped off the planet. It would be a shame if that happened and I had not done anything to support initiatives which seek to protect our rhinos,” he added. Sibusiso’s large following and profile is something that he continues to use in order to promote awareness for the plight of endangered species in South Africa. He feels that it is his duty to pass on the word of conservation. Despite having a constantly busy schedule, he is currently taking some time away from his exciting adventures to focus on a goal that might be slightly easier to achieve than scaling Mount Everest. 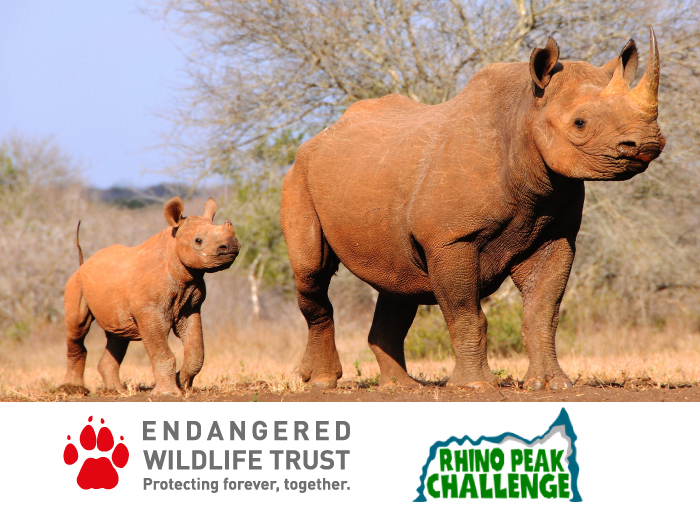 The EWT is proud and grateful to be one of the beneficiaries of the Rhino Peak Challenge, and to have an esteemed athlete such as Sibusiso representing the organisation in the event. We need more people like him!